And as always, here's a little background information about the brand! 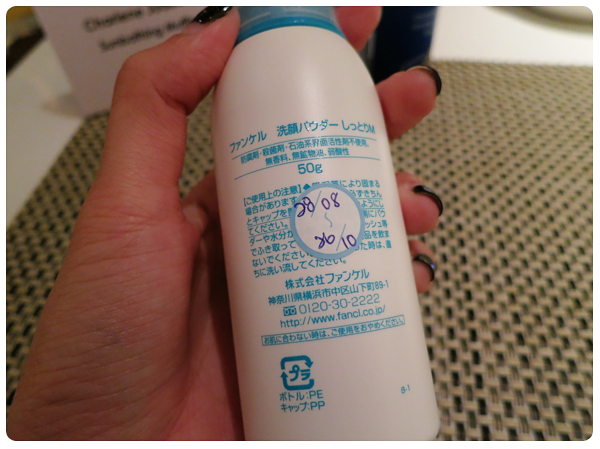 Fancl began with MUTENKA (無添加) skincare and the brand's history can be traced back to the late '70s. Japanese ladies were experiencing skin troubles that arose because of the additives in their skincare products and cosmetics. These additives include preservatives, fragrances and petroleum surfactants. Fancl's founder, Mr. Ikemori's wife, was one of them. 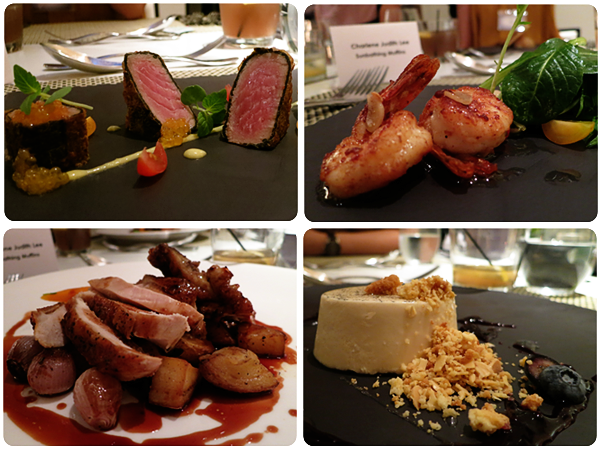 The event was held at Bistro Soori, a simple and elegant restaurant (Very Fancl!) at 2 Teck Lim Road. Before the event began proper, we were either taking a gazillion photos at the entrance (Very duh kind of thing!) or checking out our skin conditions at the 2 stations that were put up. 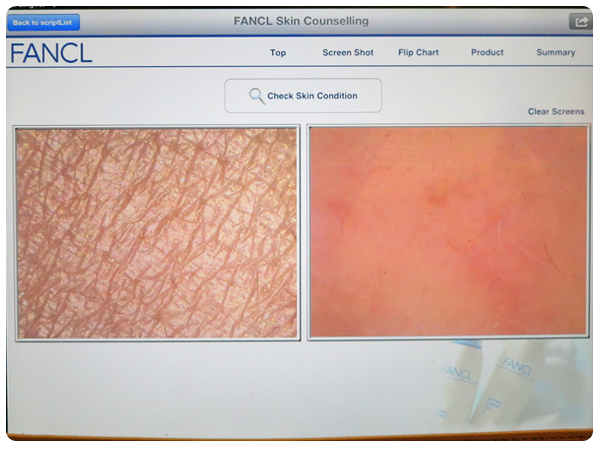 These skin analysis stations are available at most Fancl counters. The machines take a close-up snapshot of your skin and skin structure. 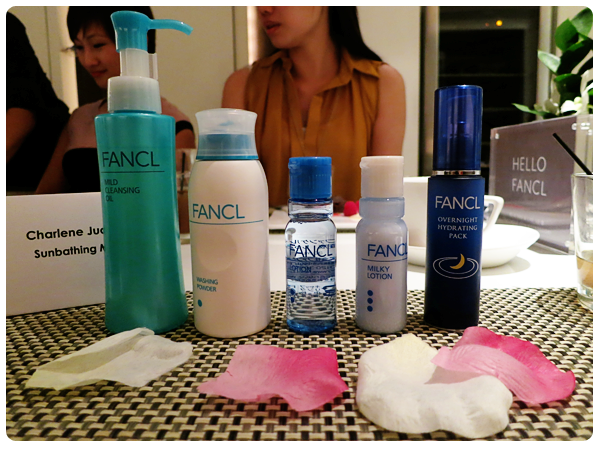 The Fancl ladies will then use the analysis from them to recommend products that are suitable for you. The above photo is a snapshot of my skin. On the left, my skin structure is displayed. The many 'triangles' on the skin tells you how healthy your skin is so... Mine's pretty good! Heh! :D Unfortunately, these 'triangles' are a little flat and this means that my skin is a little dehydrated. ): On the right, the photo shows you how severe your pigmentation is. 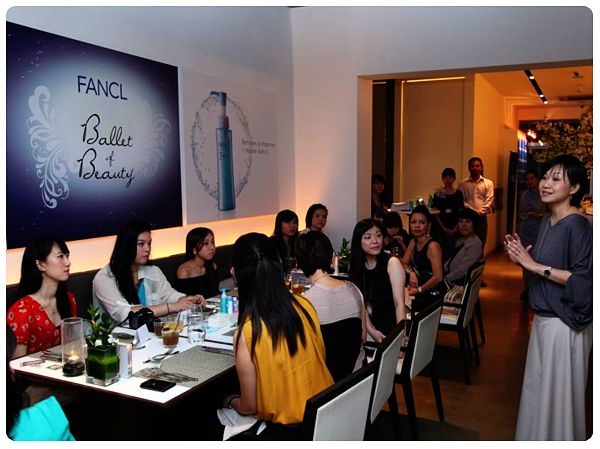 The evening then kicked off with an introduction of the brand by Elaine Low, Fancl's Marketing Manager. I had a little chat with her before the event started and gosh! Her skin is FLAWLESS. Like, really, incredibly flawless! If I remembered it right, I think she has been a Fancl user for about 12 years. And it isn't just Elaine with flawless skin! 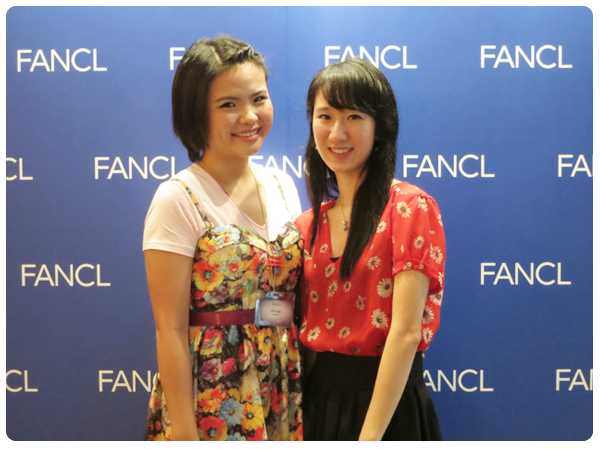 The 2 Fancl ladies whom I sat with at the table, Jane Lim (Training Manager. You will see photos of her later!) 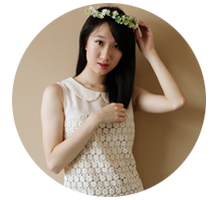 and Jolyn Yeo (Shop Development Manager. Who was a complete joy to talk to! She shared with me so many nuggets of information on beauty and life! ), have picture-perfect skins too. And they have been using Fancl for more than 5 years each (Joyln, for 8 years I think.)! Walking testimonies, literally! Here are the products that were the focus of the event! Starting from the left, there is the Mild Cleansing Oil, Facial Washing Powder, Lotion and Milky Lotion. And this is the order in which you should use them! 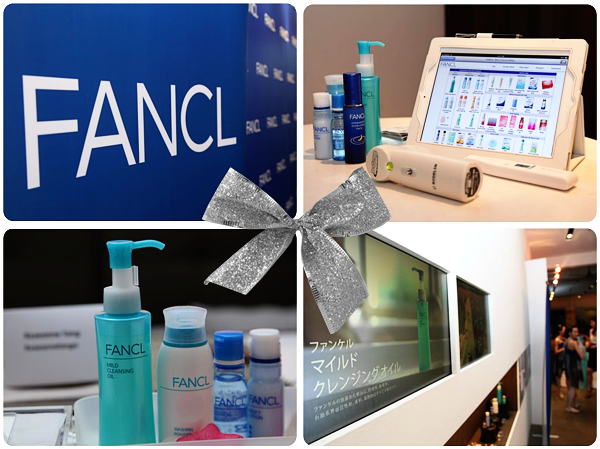 As Fancl products do not contain preservatives, the products are fresh for 2 months once they are opened. They come with stickers where you can list down the dates when you opened them and the dates when they bid you goodbye. 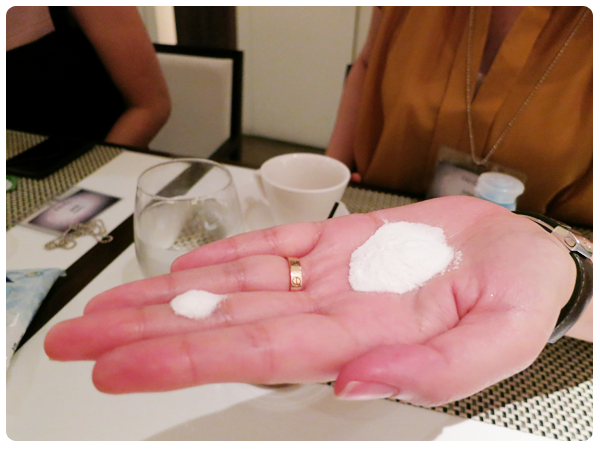 And here's Jolyn's hand, showing me how much to use for the Facial Washing Powder. Jolyn was telling me that often, customers give feedback that the powder doesn't foam up but this is because they aren't using enough of the powder! You need a 50-cent coin in order to foam it up properly. A proper foam will reduce the friction that is generated when the skin on your palms rubs against the skin on your face, and so prevents premature wrinkles from forming. Also, do take note that when you are using the foam, only the foam is supposed to come into contact with the skin on your face. The skin on your palms should not touch the skin on your face at all because then, it defeats the purpose of the foam! Meet Jane and half of the pretty set of twins who gave us a ballet performance (I took many snapshots of the performance but they are all blurred. ): )! Jane brought us through the steps of the basic Fancl regimen. In the frame that sticks out (Haha! ), is a photo of the foam. This is exactly how your foam should look like! Fluffy and dense! And before we started on our dinner, the very considerate Fancl ladies provided each of us a packet of Calorie Limit! Calorie Limit 'helps to curb the total calorie intake from food and blocks the body's absorption of fats, sugar and excess carbohydrates'. 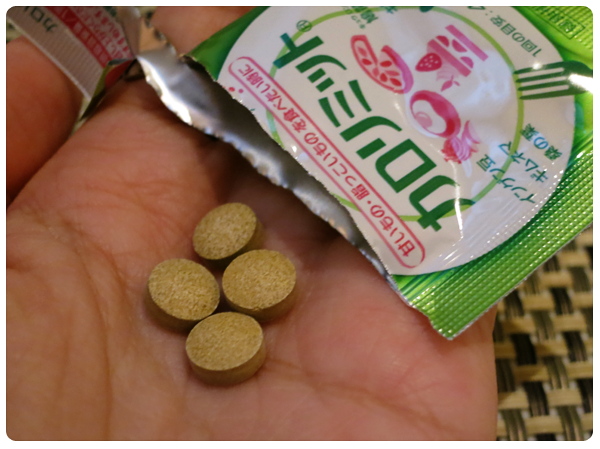 Its active ingredients are Butter Bean Extract and Chitosan. The former 'helps to control absorption of carbohydrate' while the latter 'binds around fats and cholesterol for subsequent excretion'. Our very scrumptious dinner (Thank goodness for the Calorie Limit!)! The Sautéed Garlic Prawns... GOSH! Okay, these photos are making me really hungry right now! Moving on! To end the night, we, of course, took more photos! Haha! Here's dear Juliet, who was very matchy matchy with her turquoise blazer and brand new turquoise Tocco Tenero bag (Uhhh... I just realized that the bag isn't in this photo. Haha. You know what to do! Stalk her blog!)! 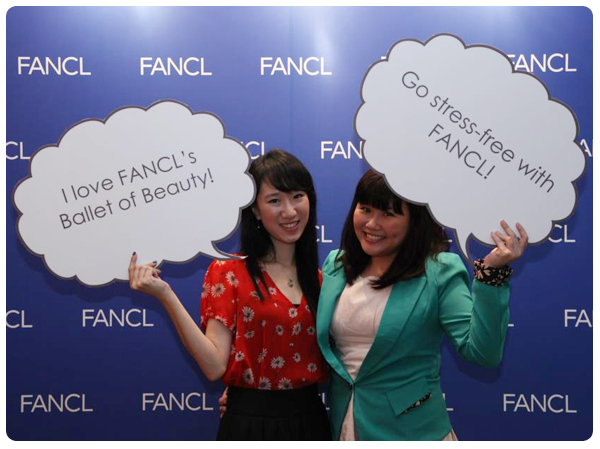 some photos are taken from Fancl Singapore's Facebook page.